Bristol, 14 November 2017 – QRoutes has announced the latest version of its Transport Planning tool, which is available online as easy to use software. Designed to simplify and improve the planning of school and special needs transport, QRoutes optimises routes and maximises vehicle utilisation, reducing operational costs. It can take many months to route significant numbers of people but, without regular re-planning, optimised routes degrade over time, resulting in unnecessary costs. QRoutes automates route planning, enabling planners to repeat the exercise as often as necessary, creating visual map-based results in minutes. The tool enables planners to explore ‘what-if’ scenarios to find new improved routes. It also interfaces with existing data sets, making it easy to implement. 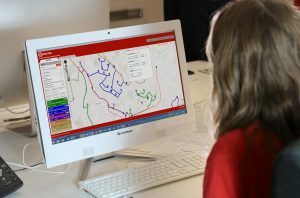 The QRoutes planner can configure the system to take into account a wide range of variables affecting each route plan. These include board and alight times for different passenger types, and road type speed settings, which can be calibrated from actual journey times. The planner configures the tool according to vehicle type, cost, time and distance travelled, CO2 emissions and other variables. New features include the ability to prioritise which vehicles are included in the routing, allowing the selection of in-house fleets over external contracts, and visibility of height restrictions that might affect vehicle access. “In developing QRoutes, we knew it was essential to produce a solution that was relatively inexpensive, could be implemented quickly and produce almost immediate results. For these purposes, it needed to be cloud-based, so that people could just turn to it and use it,” said Jeff Duffell, Business Development Director, QRoutes. “QRoutes has the speed and economic viability to re-optimise the system very quickly, and of course this can be repeated over time. It also allows planning to take place at a particular time of the year when requirements are known, rather than undertaking the process over a period of months,” explained Duffell.